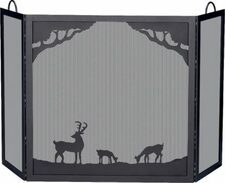 We carry fine quality fireplace tool sets, fire screens and log racks from Copperfield, Design Specialties, Stoll, and Uniflame. Made of durable wrought iron and other high-quality materials, these fireplace accessories are available in a variety of styles and designs to add a fresh look to your fireplace. We offer a large assortment of hearth tools: screens, spark guards, bellows, electric logs, gas logs, glass doors, andirons, wood baskets, log racks, damper keys, damper hooks, match holders, and more! Black wrought iron, brass, antique brass, copper, pewter - you name it, we have it! Go to Our Photo Gallery to see the variety of Fireplace Accessories and Hearth Tools that we can offer you! Copperfield Fireplace Tools are the perfect way to keep those home fires warm and cozy. 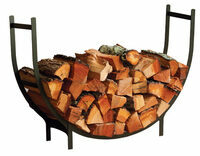 Copperfield's line of all-wood bellows are some of the most popular hearth accessories available. Made of durable wrought iron and other high-quality materials, Uniflame fireplace accessories are available in a variety of styles and designs to add a fresh look to your fireplace. Steel grates work well in either indoors or outdoors. Cast iron is best for inside use because of its vulnerability to oxidation from dampness. Hexagon-shaped models accommodate more wood for bigger fireplaces. Stainless steel grates are weather resistant and perfect for outdoor use. For the safest, cleanest hearth, take care of all of your fireplace supplies! Replace them when needed! Our Steel Bar Log Grates with “Attached” Ember Screen comes with 5, 6, and 7 Bars (3/4" and 5/8" Bar). Iron bar makes this item sturdy! And the attached ember screen holds burning wood embers. For a hotter, more efficient fire! Use with wood burning fireplaces or stoves. Black finish. 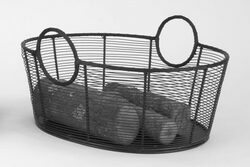 Ember screen can be attached to ANY size steel log grate! Best for inside use because of its vulnerability to oxidation from dampness. Narrow slots let air circulate through, but hold burning material securely. The grate lifts the wood up and allows the air to flow through and under the wood that is piled in your fireplace. Comes in 3 sizes: 18-inch, 23-inch, and 27-inch. Will last through many years of roaring fires. This is one strong fireplace grate, well-crafted from 304 stainless with robust welds. Traditional design and generous dimensions. Comes in 3 sizes: 23-inch, 27-inch, and 30-inch. Matches any decor! For indoor and outdoor use!